Top tips to help you choose your ideal table tennis net. A table tennis net and post set might seem to be a boring piece of table tennis equipment, but they're extremely important items. And with so many different styles available, you'll need to know what to look for and what to avoid when buying them. Unlike some items of equipment, a bad net won't necessarily spoil your enjoyment of the game, but if it doesn't look good or it's difficult to set up and adjust, it shouldn't be used for serious play. So let's take a look at what you need to know about choosing a table tennis net and post set that's suitable for YOUR needs. So what do you need to look for when choosing a net and post set? What do the rules say about the net and posts? The bottom of the net, along its whole length, shall be as close as possible to the playing surface and the ends of the net shall be attached to the supporting posts from top to bottom. Before we go any further, it's important to know the difference between the The Laws of Table Tennis (commonly referred to as the rules) and the International Regulations. The Laws are the "basic" rules of the game and are mandatory for all sanctioned table tennis events, whereas the International Regulations contain supplementary rules which are used in addition to the Laws in all international events and also in many higher-level domestic events. 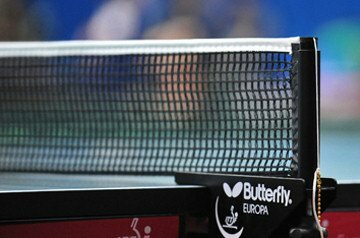 So the basic rules for a net are as set out above, but if your net will be used in a competition where the International Regulations are being used, it will also have to be one which has been approved by the International Table Tennis Federation (ITTF). You'll find a list of approved nets below. The net is intended to be an obstacle, but it shouldn't increase the probability of a player gaining a lucky point. Therefore, a ball hitting the top of the net should either fall back on the hitter's side or bounce forwards - it shouldn't just roll over onto the receiver's side. This means that the tension along the top of the net should be significantly higher than the rest of the net. Therefore, the fabric must be suspended by a cord which must be tight, and it must be attached relatively firmly to the posts, but hanging from the cord. Net assemblies which do not have a suspension cord therefore cannot be used in sanctioned events. But remember, as we discussed above, if your net will be used in a competition where the International Regulations are being used, it will also need to comply with additional criteria AND be on the approved list. If your net is going to be used in sanctioned events, the net assembly must be one which has been approved by the the International Table Tennis Federation (ITTF). The upright post must be a single matt colour, and cannot be white or yellow. The net must be made of soft dark mesh and have a white or pale yellow top (tape) not more than 15mm high. The mesh should be made of spun fibre rather than single filament and the knots should be firm and regular. The mesh should not be less than 7.5mm square or more than 12.5mm square. Of course, it's important to remember that if you're just playing for fun, then your net will not have to meet all these additional requirements. So, how do you choose the right table tennis net for YOU? Well, if you're looking for a table tennis net to use at home, or for a table that won't be used for serious competitive play, then there's a vast range of different nets to choose from. Although some new table tennis tables have a net and post set supplied with them, in most cases you'll need to choose your own net and post set separately. Outdoor tables generally have a net assembly which is permanently affixed to the table. some rollaway tables also have a net assembly which is permanently affixed to the table, although these are usually the correct length of six feet. 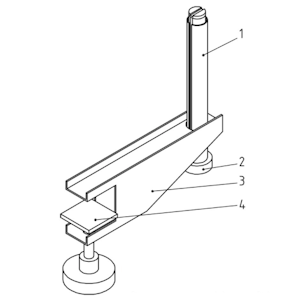 Some net assemblies use a spring loaded clip to attach the net assembly to the table. These are popular because they're quick and easy to attach to your table. But the most widely used variety are the hand tightened screw clamp. These provide the best stability and adjustment capabilities. 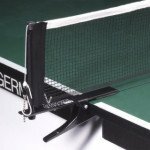 What type of table tennis net do you need? 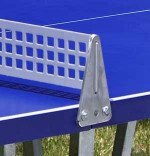 Unless you have a table tennis table which has a net assembly permanently affixed to it, you'll need to choose either a spring loaded clip or a hand tightened screw clamp net assembly. These type of table tennis nets are easy to attach to a table, and to take off ... so they're great for schools and for home use, or if you're just in a hurry. However, the spring clip can become worn over time and you'll find that it'll become more difficult to keep it in place. 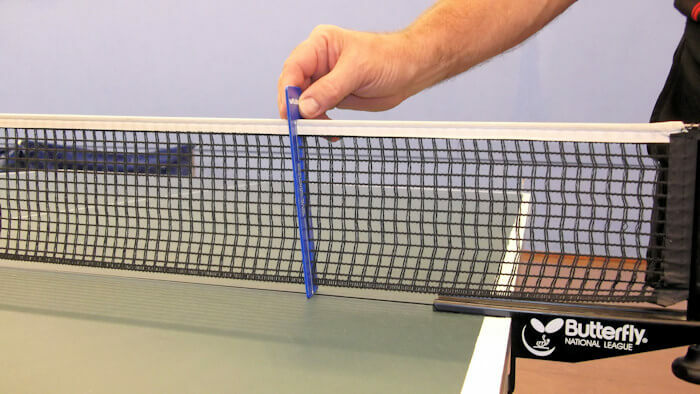 If you're just playing for fun on a home table, you may only want a cheap table tennis net. The cheapest available in this category have a very basic clamp as shown here. However, the net is usually only 5 feet or 5 feet 6 inches long and the net height may not be adjustable. Another similar net, suitable for home use is as shown here. This also has a very basic clamp, but the net is usually the official length of 6 feet, although the height may or may not be adjustable. This type of screw clamp which is much sturdier and of much better construction. The screw clamp and the net height are both adjustable which means you'll be able to ensure that the net is at the right height and tension. A net gauge enables you to set the net to the correct height (6 inches / 15.25 cm). 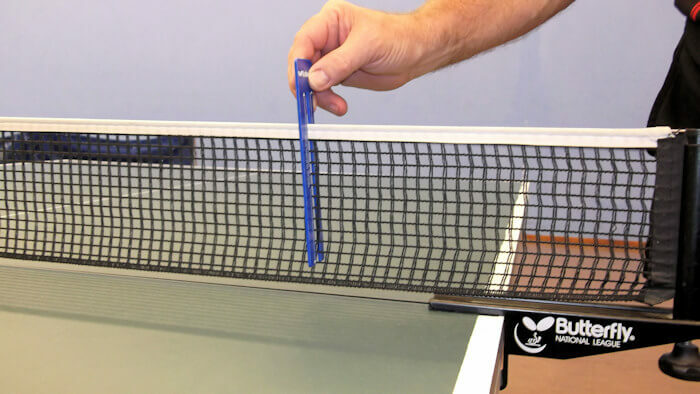 The net gauge also doubles as a tool to measure the thickness and flatness of your racket rubbers to ensure that they meet the ITTF regulations. They're made of plastic and they're really easy to use. The height of the net is then adjusted so that the net gauge hangs on the top of the net and the bottom of the net gauge just touches the table surface. Here's an example of an umpire re-measuring the height of the net after the table was accidently moved by the World number one, Ma Long (red shirt), during a rally. Umpires are instructed to measure the height at three positions (approximately 30cm from each net post and in the middle). NB. There is no sound on this video. You can buy your net and post sets and other table tennis equipment here in my store. 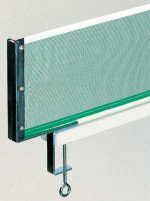 If you need a top quality net, and one which complies with all the additional requirements of the International Regulations, then you'll need to choose one from the approved list. So here is a list of ITTF approved table tennis nets valid from 1st January - 31st December 2019. You can buy your TT nets and other table tennis equipment here in my store.